The problem that I have with this interpretation is that it is been observed simultaneously across thousands of light years at least. This is either absurd or plausibly, these galaxies are vastly closer to us than we had ever imagined. Recall that our measurement protocol is dependent on one rather iffy assumption that has been producing a number of uncomfortable inferences over the years. For the record, my own work explains the Red shift as an artifact of the age of the universe itself and unrelated to galactic velocity which is in fact generally modest and over the whole likely neutral. It should still give the same results. 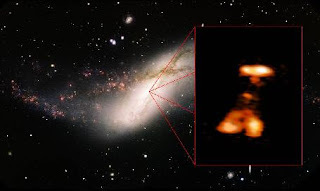 We are still dealing with vast distances so just what could a galactic core actually be? Is it really less that a dozen light years across which is the implied inference? Again are our metrics quite right? I suspect otherwise and what else have we got wrong?